Thousands of motorists are victims of accidents each year due to poor road design or conditions. 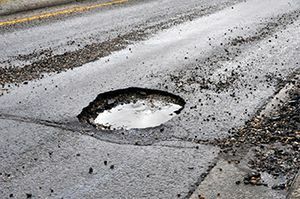 Many factors can contribute to a road being dangerous, from defective roadways to dangerous intersections and potholes and unsafe shoulders. Even if human error contributed to your accident, there is a chance that unsafe and poor road design and maintenance also played a role in your accident. If you or someone you know was injured in an auto accident due to poor road design or conditions, you may be entitled to compensation. Contact our experienced attorneys today for a free case evaluation. It is the responsibility of towns, cities, and governments to keep roads in safe condition, but as we all know, this doesnt always happen. Flaws in road design or failure to keep a road clear(http://www.edwardslawok.com/accidents-caused-by-bad-roads.html) and safe usually means an accident could have been prevented. Seeking compensation against a government entity can be especially confusing. Expert witnesses are often needed to testify about the safety of the road. These cases are not as black and white as a traditional auto accident where one party is at fault. The experienced personal injury lawyers at the Edwards Law Firm have won over $100 million in verdicts and settlements on behalf of injured people just like you. If you have been involved in an auto accident due to poor road design, get experienced legal help from our auto accident injury lawyers. If you have been involved in a car accident that involved distracted driving or any other cause, call us as soon as possible at 800-304-9246 or fill out a Free Case Evaluation form.